Leading real estate developer, Rustomjee Group's flagship luxury development Paramount, Khar(W) has completed yet another unique milestone. The project has received its Occupation Certificate (OC) for its D and E Wing and had earlier received OC for other 2 of its prominent wings - A and B. 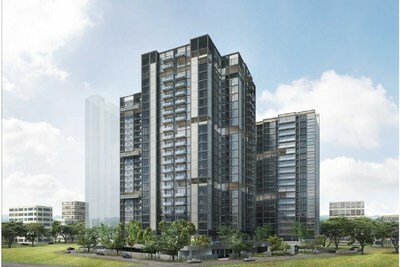 The D and E Wing comprises of 3 and 4 bed sea view residences starting at Rs. 7.99 Cr*. Rustomjee is renowned to be a 'thoughtful developer' and for good reason; they create not just impeccably designed structures with the best quality construction and stylish interiors but homes that people enjoy living in and also create a lifestyle that is superlative in every way. Rustomjee Paramount is one such project that is not only one of the largest developments in Khar but also probably the only gated community project in the Khar-Bandra area. The multi-storeyed towers are designed by renowned architects Sanjay Puri from Sanjay Puri Architects, Mumbai. The gated community is strategically located - with easy access to the Western Express Highway, S.V. Road, Bandra-Worli Sealink and also the international airport. It is close to the BKC business district as well as in proximity to education, healthcare and entertainment facilities. Most of the residences boast of sea views, such that the A and B Wing have been sold out. Living in a gated community fosters a sense of bonhomie and the chance to connect with like-minded individuals who share similar status and interests in life. Where kids get the chance to make friendships that will last a lifetime. This is probably the only project in the Bandra-Khar area which has over 30 amenities that further provide the residents an opportunity to bond with their neighbors either while taking a dip in the saltwater pool or watching their kids have a play date in the toddler's studio. Elderly residents can enjoy the peace and quiet of the Senior Citizen's Zone, all while being assured that their safety and security has been taken care of. In fact, the Alfresco sky lounge, toddler studio, banquet hall, gymnasium, mini theatre and business centre are ready and functional. Rustomjee ensures that residents can truly enjoy the luxury of space - 'My Space' - the opportunity to unwind and de-stress with their hobbies and interests. Throwing light on the OC received for D and E Wing of Rustomjee Paramount, Mr. Percy Chowdhry, Director, Rustomjee Group said, "Rustomjee Paramount encapsulates everything that Rustomjee stands for. We believe in not just creating brick and mortar buildings but homes that are an experience in themselves, bringing all the trappings of aspirational living to the residents that will elevate their standard of living. For example, the project offers a fully functional first-of-a-kind rooftop Alfresco Sky Lounge in the Bandra-Khar area, with several events already being hosted at the Alfresco Sky Lounge for the benefit of the residents and their guests. All our projects are registered under RERA and in fact, the D and E wings of Rustomjee Paramount have received the OC so our customers can enjoy the pleasure of living in an exclusive gated community with 3 and 4BHK sea view residences without having to stretch their budgets to pay GST." When there is so much space, there is the advantage of living in green environs which is such a rarity in a city like Mumbai. This is certainly where a gated community scores over a run of the mill standalone building. Security is a major concern of all these days that that is where one finds the advantage of living in a gated community, not only are the residents known to each other and have developed friendly relations, but the children are safe as well. There are CCTVs in the children's zone connected to all the homes so that parents can keep an eye on the children. In addition, for further safety and security, there is a provision for RFID tags for children and pets. For those seeking to move into their new home this festive season, during the most auspicious days of the year, D and E Wings of Rustomjee Paramount have received the OC (occupation certificate) - enjoy future ready sea view residences with all the benefits of a gated community. Rustomjee lays emphasis on adding value to the lives of their homeowners through their core business, their CSR initiatives and philanthropy. They have strived to ensure that every blueprint includes child-friendly spaces for parks, playgrounds, and learning rooms and thereby encouraging families to spend quality time with each other. To know more about Rustomjee, please visit http://www.rustomjee.com.